I was recently interviewed by GlobeSt.com to discuss Chinese investment in the United States, including why the US is an attractive market for Chinese dollars, how it helps the US economy, and what it means for the Chinese market. Some selected excerpts from our conversation are below. Chinese investors will deploy a record $212.7 billion in investments outside China. This trend is driven by a number of factors: Chinese real estate and stock market bubbles are bursting; The Chinese economy is slowing down so foreign investment (as in the US) are more attractive; The yuan has been depreciating against the dollar, making US dollar-denominated investments more attractive. Many Chinese investors, ranging from very wealthy individuals to insurance companies, find themselves with significant amounts of cash that need to be deployed into large, high-yielding investments. US commercial real estate is one of the few markets and asset types that can meet these requirements (large, high-yielding). Chinese foreign investment has been encouraged by the Chinese government for building “soft power,” which is building the image of China and expanding its influence. Finally, many Chinese investors see synergies for using their foreign investment to take advantage of the Chinese market. Chinese travelers are expected to spend more than $72 billion at home and abroad in 2016. So everything related to travel, tourism, lodging, and entertainment plays into this growing market. Asians love the U.S. as a place to live, buy homes, invest, go to school, and run their businesses. Over the past five years, we have seen an unprecedented increase in foreign investment in the US — particularly as a new flood of Chinese investors joins the tide of Japanese, Korean, Malaysian and other Asian investors. My partner Scott Harshman counsels foreign investor clients from all over the world. He tells them that it is urgent to get an early grip on potential U.S. tax consequences and structures when first contemplating their investment in the U.S. The key is doing the analysis BEFORE making the investment. The earlier, the better. Otherwise, the unfortunate foreign investor may become ensnarled in a messy tangle of tax and regulatory issues never imagined. Here is what Scott says . . . It does not matter whether foreign individuals are investing in U.S. property and hoping to become residents in the U.S., or are planning to invest in U.S property without U.S. residence: the investment is particularly complex for these individuals. The definition of “U.S. property” for international tax purposes is a term of art, and the details are complex. That is why – to avoid potential problems and minimize U.S. tax exposure – planning for the ownership of U.S. property should be done before the investment is made. Alice Gao, Senior VP of ICBC USA, speaks with Bob Braun, senior member of JMBM’s Global Hospitality Group® at JMBM’s 2016 Meet the Money® – the national hotel finance and investment conference. Alice explains the structure of ICBC USA, discusses interest rates, and Chinese immigrant investment in U.S. gateway cities. Bob Braun: I’m here with Alice Gao, who’s a Senior Vice President of ICBC USA. Alice, thank you very much for coming and spending a little time with us today. Alice Gao: Thank you very much. Bob Braun: Alice, I’d like to ask a few questions which I think you’re very suited to in your position with ICBC. One question I’d like to ask is, what kind of projects are the bank most interested in lending to these days? Are there things that attract you more than others, or are more interested in than others these days? Alice Gao: Well, let me just start with a brief introduction of our bank. I’m very excited that as of December 2015, the bank continues to be ranked as the number one largest bank in the world by total assets of $3.6 trillion, and also as number one on tier one capital, about $215 billion. We are also ranked number one by net profit of $44 million. So, with that, in the U.S., we have four financial institutions. So, the four together provide a full array of products and services. The first financial institution is ICBC Financial Services: it’s a broker dealer of security services. And we also have ICBC Standard Bank, which is a financial market and commodity bank based in New York. We also have ICBC New York Branch, which is a wholesale bank of ICBC Group. And lastly we have ICBC USA, a Federal Charter full licensed bank, FDIC insured. So, ICBC USA has thirteen branches and one service center. We have three branches in New York, ten branches in California, one service center in Seattle. Together with these four financial institutions, physical locations and e-banking platform, we offer not only traditional deposits and loan services, we also offer a variety of products such as cash management, trade finance, treasury and also foreign exchange. Our strongest point to distinguish us from others is we do offer variety of services of onshore and offshore renminbi products. Bob Braun: So most of the lending that you would do on hotels is through ICBC? 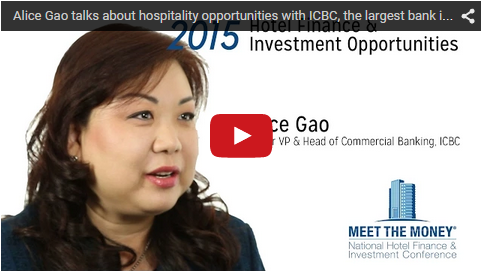 Alice Gao: Most of the lending for hotels is through ICBC New York Branch and ICBC USA. Patrick Hogan, CEO of CMB Regional Centers, speaks with David Sudeck, senior member of JMBM’s Global Hospitality Group® at JMBM’s 2016 Meet the Money® – the national hotel finance and investment conference. They discuss the evolution of the EB-5 Immigrant Investment Visa Program, indirect jobs, completion guarantees, and taking care of the investor. David Sudeck: Hi, I’m David Sudeck, I’m here at the 26th annual Meet the Money® Conference with Pat Hogan, CEO of CMB Regional Centers. Welcome Pat. And thanks again for participating this year. You were on stage earlier on the CEO panel and you did a fantastic job. Patrick Hogan: Well thank you, I’m pretty excited to be here. It’s an interesting group of people. David Sudeck: EB-5 is hot right now. I was wondering if you could tell us a little bit about the roots of CMB, how things have changed from the 1990s to today, and what you see as your current platform. Patrick Hogan: We started in 1994, before regional centers were ever involved. David Sudeck: So you were pushing for regulation? Patrick Hogan: Yes, even back then. So, fast forward to today – and we’ve been rocked with all kinds of scandals and things like that within EB-5 – which you would expect. Because if you go back to 2007 there were eleven regional centers, and maybe five of us doing something. And then to go to today where you have 800 regional centers – there’s bound to be some individuals that don’t have a clue. More than 700 people are gathering the next two days in New York City for one of the largest EB-5 financing conferences in the country. We are proud to be a platinum sponsor of this program, and I am looking forward to my panel on how to finance hotel construction and development with EB-5. Hosted by EB-5 Investors Magazine, this event will be held July 17-18, 2016 at the Sheraton Hotel in Times Square. The first day is comprised of three tracks of workshops and Monday is a full day of panels on EB-5 topics of current interest. Alice Gao, Senior Vice President of the Industrial and Commercial Bank of China, discusses ICBC’s global reach, its U.S. lending program, and recent deals in the video below. Alice spoke with David Sudeck, a senior partner in the JMBM Global Hospitality Group®, as part of our video interview series on hotel finance and investment opportunities in 2015. David Sudeck: We’re here at the Meet the Money® Conference 2015, which is the 25th Annual Hotel Investment Conference for JMBM. I’m sitting here with Alice Gao, Senior Vice President and Head of Commercial Banking with ICBC. Thank you for joining us. Nice to see you. 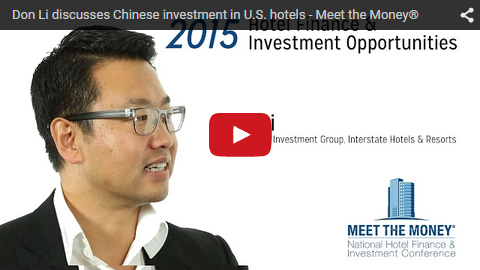 Don Li, head of Asia Investment for Interstate Hotels, speaks in the video below about what drives Chinese investment in U.S. assets, why an understanding of language and cultural issues is important, and what types of hotels foreign investors are looking for. Don sat down with David Sudeck, a senior partner in the JMBM Global Hospitality Group®, as part of our video interview series on hotel finance and investment opportunities in 2015. David Sudeck: I’m David Sudeck. I’m a partner with JMBM’s Global Hospitality Group®. We’re here at the 2015 Meet the Money® Conference which is the 25th Annual Meet the Money® Conference. Thank you for joining us. I’m here with Don Li, the head of Asia Investment for Interstate Hotels. Click here for the latest articles on Chinese Investment or here on EB-5 Financing. As the Chinese economy continues to become more important globally, we are seeing a shift in Asian investment in the United States, particularly in California. 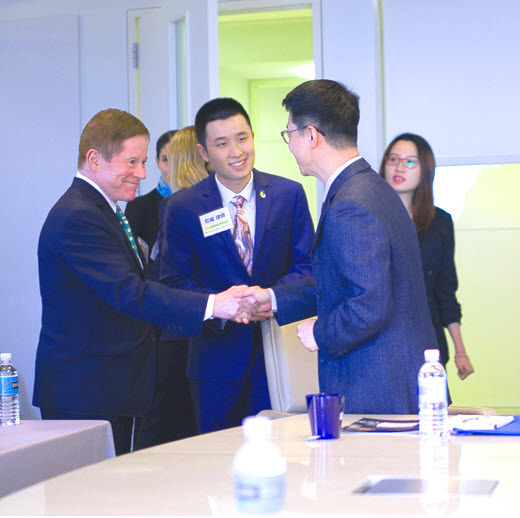 Chinese investors will become even more active and influential over the next 10 years, and will continue adapting to Western business practices while retaining a critical sensitivity to their Chinese roots and the demographics of the Chinese population in the United States. China’s demographics are inescapable. It has the largest land mass in Asia and third largest in the world. It’s the most populous nation, with more than 1.3 billion people. And by some measures, China is on track to replace the U.S. as the largest economy in the world by December 2014. As the Chinese economy has exploded, so has the number of individual Chinese millionaires, billionaires and state- and privately-owned companies with huge cash reserves to invest outside China. Additionally, a large rising middle class now finds itself with money to travel internationally. Over the past five years, Chinese tourism in the U.S. has tripled–and is expected to increase significantly in the next 10 years. During this same period, Chinese foreign investment has expanded dramatically, with the U.S. as a favored target. We’ve written extensively about the popularity and success about the EB-5 program in China, but it represents only a drop in the bucket, both in terms of immigration–the EB-5 program provides less than 1% of total immigrant visas each year–and in investment. Chinese foreign direct investment in the U.S. since 2000 now totals approximately $40 billion, and it has grown from a mere $58 million in 2000 to about $14 billion in 2013. The Chinese investors of today are much shrewder than only a year or two ago. Increasingly, they are the largest banks, construction companies, insurance companies and pension funds in the world, who have virtually unlimited resources–and who find U.S. real estate and technologies to be “cheap.” These investors have learned that the most experienced advisors are essential to avoid the mistakes some of their predecessors made.